See here for my wall of text introduction to making a quilt by using Play Craft’s Equal. This thing is still preying on my mind, so I decided to crunch some numbers and see if I could calculate yardage estimates for making it! 😀 I adore stuff like this, I really do. (Hey, I’m a scientist – clue’s in the blog name! ;)) This post is likely to get pretty mathsy pretty quick, but I’ll do my best to explain my workings and keep it all clear. How many triangles in a strip? This is a crucial question. We’re not just cutting umpty same-width strips and cutting them into triangle units, as I did here, we need strips of three different widths to match the three triangle heights we know we need, and we need to know how much fabric that will require. So, we need to know how many triangles we can cut from strips of different widths – obviously, wider strips will give fewer triangles and require more fabric overall. After doing some rough calculations on my mobile phone (I was almost embarrassingly excited to discover it had a scientific mode! ), I decided that it would be best to calculate the total length required for all triangles of each size and colour, then divide that by the length of a fat quarter (which I’m taking as 21″). Great! We can see that one side has three triangles and the other has two + two half-triangles. For simplicity, I’m going to count that as a total of six triangles (3 x 2). In my calculations, I will divide the total of number of triangles needed by 2, then multiply that number by the triangle width to give the total length needed; I think this will give a good enough estimate for my purposes. Once I calculate the total length of strip I’ll need for each triangle I want to cut, I can divide that number by the length of my FQs to find how many strips I should cut of each width. Yay! I’ve used this information to calculate yardage estimates for some example sizes of quilt (based on small triangles with finished sizes of 1″, 1.25″, and 1.5″) to see how big a quilt I can make with the fabric I have (5 FQs and 1 half-meter, which I’m counting as 2 FQs here). I’m in the UK, which means my FQs are metric and should measure 25cm (or 19.5″) wide (assuming the person who cut them knew how to use a rotary cutter; that’s a BIG assumption!). I have 2 FQs of dark fabric, 2 FQs of medium fabric and (effectively) 3 FQs of light fabric. Triangles finish at 1″, 2″, 4″. Small 1.75" 2.02" 141 70.5 142.46" 6.78 7 12.25"
Medium 2.75" 3.18" 126 63 200.05" 9.62 10 27.5"
Large 4.75" 5.48" 13 6.5 35.65" 1.69 2 9.5"
Small 1.75" 2.02" 71 34.5 71.73" 3.41 4 7"
Medium 2.75" 3.18" 55 27.5 87.32" 4.15 5 13.75"
Large 4.75" 5.48" 8 4 21.93" 1.04 2 9.5"
Small 1.75" 2.02" 60 30 60.62" 2.88 3 5.25"
Medium 2.75" 3.18" 51 25.5 80.97" 3.85 4 11"
Large 4.75" 5.48" 11 5.5 30.16" 1.43 2 9.5"
This is easily in range of my fabrics, but it would be nice to make the quilt bigger if I can! Triangles finish at 1.25″, 2.5″, 5″. Small 2" 2.30" 141 70.5 162.8" 7.75 8 16"
Medium 3.25" 3.75" 126 63 236.42" 11.25 12 39"
Large 5.75" 6.63" 13 6.5 43.15" 2.05 3 17.25"
Small 2" 2.30" 71 34.5 71.73" 3.90 4 8"
Medium 3.25" 3.75" 55 27.5 103.20" 4.91 5 16.25"
Large 5.75" 6.63" 8 4 26.55" 1.26 2 11.5"
Small 2" 2.30" 60 30 69.28" 3.29 4 8"
Medium 3.25" 3.75" 51 25.5 95.69" 4.55 5 16.25"
Large 5.75" 6.63" 11 5.5 36.51" 1.73 2 11.5"
The dark and medium fabric requirements are ok, but the light fabric requirement is much more than I have. Quilt 1 it must be! 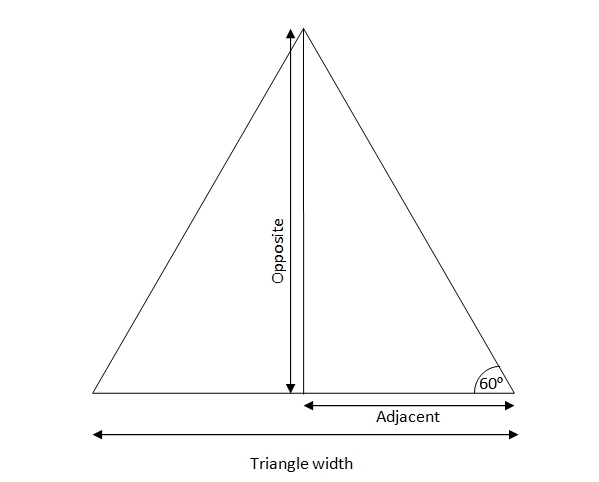 Triangles finish at 1.5″, 3″, 6″. Small 2.25" 2.59" 141 70.5 183.16" 8.72 9 20.25"
Medium 3.75" 4.33" 126 63 272.79" 12.99 13 48.75"
Large 6.75" 7.79" 13 6.5 50.66" 2.41 3 20.25"
Small 2.25" 2.59" 71 34.5 92.23" 4.39 5 11.25"
Medium 3.75" 4.33" 55 27.5 119.07" 5.67 6 22.5"
Large 6.75" 7.79" 8 4 31.17" 1.48 2 13.5"
Small 2.25" 2.59" 60 30 77.94" 3.71 4 9"
Medium 3.75" 4.33" 51 25.5 110.41" 5.25 6 22.5"
Large 6.75" 7.79" 11 5.5 42.86" 2.04 3 20.25"
All of these are now well over my fabric allowance. I would need 1.25m (4.5 FQs) of light fabric and 0.75m (3 FQs) each of dark and medium fabric to make this size of quilt. I will start by cutting the largest triangles first and make sure that I have all the full and half triangles needed for each colour before I start cutting the next size down, and so on. And then I will probably fervently wish I had a design board to stick them all on! 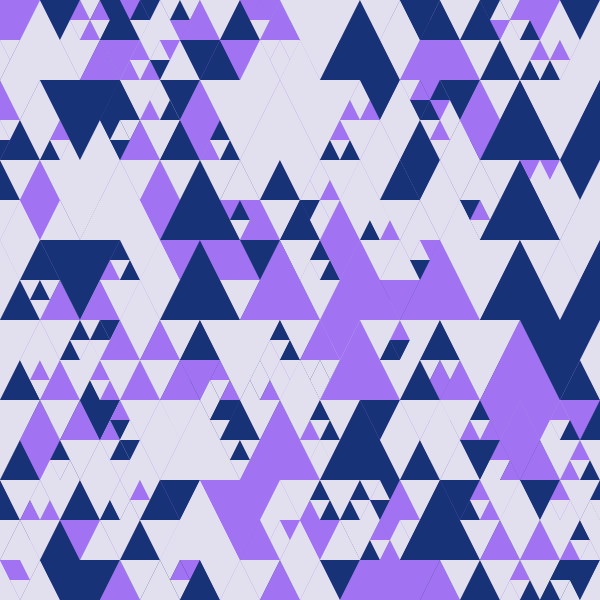 After pondering the design, I’m thinking that it may be best to construct large triangles from the smaller triangles and then piece them all together in rows. So the most awesome thing about you writing all these detailed notes? It makes it a LOT easier to add this to the program since you have the formulas right there! Next Next post: Play Craft’s Equal – CUTTING! SEWING!